The first somewhat grizzly sounding task was to take apart the whole lechon head. I have always loved Italian guanciale, a fattier type of bacon or cured meat made from the cheeks of a pig, so I thought I would start by removing the meaty cheeks. They were stunning. And delicious on their own. 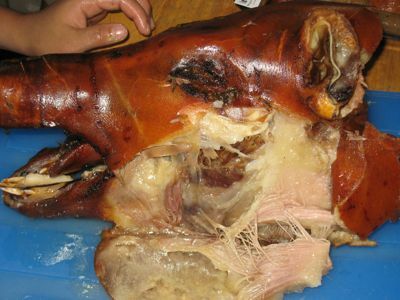 Slowly, with the help of the cook, we quite literally took the head apart and ended up with two huge bowls of skin, ears, snout, cheeks, etc, which we had chopped up into small pieces with a cleaver or a sampaloc chopping block. The amount of meat, skin and cartilage we managed to extract from the lechon’s head was incredible, perhaps 10-12 cups worth! Version I of this sisig experiment started by turning the heat on full blast under the biggest cast iron pan we had in the house. After about 5 minutes on the flames, the pan should be very hot. Add about a tablespoon of oil, then about 1-2 tablespoons of ginger, two chopped onions or so (adjust amount to your liking, but you need a lot), several cloves of garlic, chopped, several siling mahaba chopped up (I used 8 pieces for 5 cups of meat) and saute for 2-3 minutes to soften the veggies, add the chopped lechon and let this sizzle and crack for a while. Don’t make too much at the same time as it may stew with all of the moisture in the pan. When all liquid has evaporated and the stuff is sounding like it is frying, add the juice of several kalamansi, several tablespoons of native vinegar to taste, and I added a couple of tablespoons of kikkoman soy sauce and salt and cracked black pepper to taste. Keep stirring to prevent this from sticking to the pan. You guauge how brown you want it to get, I found, a fairly dark brown was quite yummy, almost like adobo flakes but with texture. If at home, serve this directly from the hot cast iron pan, with a case or so of ice cold beer and some fresh chicharon on the side. :) You can also transfer this to a serving dish and serve hot. Have extra kalamansi on the side to kill any overly fatty mouthfeel. The taste? A “slam-dunk, omigod, that was terrific dish!! !” I kid you not. If you have been unsure or squeamish about sisig before, try this easy version. It is rich without being overly rich. It has flavor from the slowly roasted pig. It has skin, meat, cartilage, for all the right textures. You can make it as spicy as you want, but if you balance the spice with saltiness and fat, it is utterly superb. I realize this is typically served as a pulutan or appetizer, but this was excellent with a huge pile of freshly boiled rice! Thrilled with the results of the first batch, I immediately put the cast iron pan back on the heat and when it was sufficiently hot, I started a second batch. Before cooking sisig this time around, I looked up as many recipes as I could find, and I was intrigued by suggestions of how to make it more “creamy,” apparently a desired attribute of this dish to some connoisseurs. I also wanted a smoking hot (spicy) version as someone told me this is how it is made in Pampanga. So instead of siling mahaba, I chopped up 8-10 siling labuyo and used that instead. I also added about 4 tablespoons of chopped ripe pineapple for a different source of acid and a touch of sweetness. Then before finishing the dish off, I added two tablespoons of mayonnaise and at the last second, a raw egg that was mixed in with the rest of the ingredients. This second version was definitely creamier and richer on the palate. It was good, but definitely not as good as version I. To me, the ideal version might be the first one made with siling labuyo instead of siling mahaba if you like spice as I do. The second version was a bit muddled, just too much going on for me. I am allergic to pineapple (my only known allergy) so I only ate a little bit of this dish, but I definitely liked the first batch better. At any rate, both versions were a total hit, everyone in the house ate far more than they should have! And we probably have to eat steamed vegetables for a whole week just to compensate for the fat… Yum! carina, I know what you mean, I cringe at nearly every dish with pineapple, I think it is a Del Monte conspiracy….heehee! mm, you are great. Now I have other alternative from leftover lechon. Normally its just lechon paksiw, now I will definitely try your sisig lechon. Thanks for always coming up with new dishes and alternative ways of cooking old favorites. yum yum yum. . . I really don’t know that you could make sisig from lechon. . .and as much I can, I avoid ordering this for a meal and opt for a healthier dish but when I do, I don’t like having egg on top of it instead i go for fried egg on the side. . . chicken sisig from jay-j’s resto in Timog (I don’t know if it’s still there) is good too. . . I grew up eating pigs ears kilawin so I don’t mind that that much but your comment on earwax just made me want to pewk…I too looked up sisig on the internet and found one I think I can tolerate and that is barbecued/grilled pork bellies and maybe some pigs ears…watching out for the earwax…but everything else just does not mix well with my tummy. OMG! ;) i love lechon, lechon paksiw, and now this! thanks, mm! My friend uses pig’s brain also to make the sisig creamier. This morning, my doctor called me and informed me that my cholesterol is up and so is my glucose reading. I will have to take a pass on this for about a month. As with Lani’s friend, we use pig’s brain to make sisig creamer. If pig’s brain is not available, we add mashed, grilled chicken liver instead. MM, my Ilocano lola used to make a dish called “dinakdakan” which used the pig’s brain, and it was creamy, soooo good. I have managed to lose 13 pounds in as many weeks but I would willingly start over again if I could eat a big bowlful of the sisig in the last picture…ay-yay-yay! I was just going to say this sounds like dinakdakan. My husband is Ilocano and it’s his favorite! 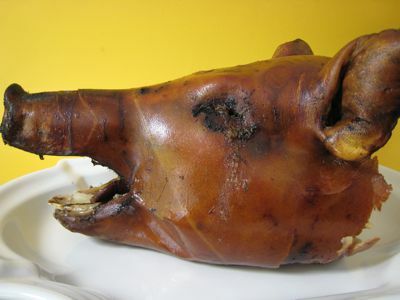 Hi MM, this really looks so sarap, I will definitely try it next time I find lechon head on sale. I hope it’s available in makro, where I usually buy our stuff, anyway Congrats again MM for a super interesting dish, MABUHAY! Hi MM, sarap, nothing a lipitor tablet won’t cure. that dish is perfect with Ice Cold San Miguel Pale Pilsen. Here in the states we can’t get the original San Miguel. Next time maybe a good beef papait dish. Really like your posts. First time I heard that dish with Pineapples. I loooove sisig! I’d looove to try the one with pineapples, so love the fruit and anything with it!!! Wow… Time to re-season my cast iron! Mmmmm… I love sisig! I wish I could remember the restaurant my friends and I used to go to for our sisig fix. It in Diliman but outside the UP campus, and not on Katipunan Road. Ah, it was so many years ago. It’s probably not there anymore. for a more cholesterol friendly sisig, try left over fried chicken or turkey. A more healthy one is sisig salmon skin. My dad and uyab would love this sisig. And since lechon head has the brain in it, I can make a creamy one and a drier one! Can’t wait for the next lechon head from Cebu! Fried-neurons, do you mean Trellis? They have long been famous for their sisig. It’s still there. I don’t think it’ll close anytime soon, as Trellis has legions of loyal fans. :-) They used to have a Makati branch on the end McKinley, I suppose near where Fort is now, but that closed years ago. Frankly, I don’t get the squeamishness about eating pork face and ears at all. To me, they’re not much different from the other parts on the outside of the pig. Just last weekend, we took my brother’s Venezuelan girlfriend to Aristocrat for another round of Filipino food (we’ve been plying her with as much Pinoy fare as we can). She’s liked everything she’s tried so far, and enjoyed sisig, too. But right after tasting it, my dad told her what it was made of, probably expecting (hoping for?) a grossed-out reaction. She didn’t bat an eyelash; in fact, she reacted as if there was absolutely nothing unusual about it, which I thought was great! Then again, I’m sure they have much more unusual food where she’s from. The sisig in Trellis (Market! Market!) is also good. I never thought that lechon can be sisig dish. If I have enough time, I will try this myself. Perfect dessert after… coffee and leche flan! Yummy! I bet many people are wondering what you did to the brains MM! Oh to miss that is mortal sin in lechon-to-another-dish department. Whenever the lechon head gets to be taken home in our family, the brain would always be a part of the lechon paksiw sauce. That should have made a world of a difference to the sisig I tell you. 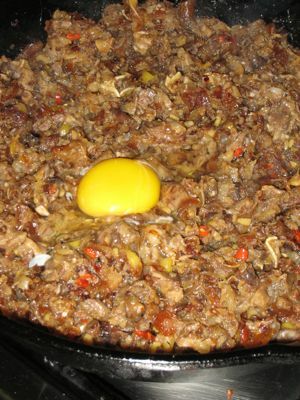 Originally, Pampangenos use either pork brains or cow brains for the original sisig. To recognize original sisig, it is always the less crunchy kind, of which is actually sisig number 2. The crunch comes from the addition of chicharon or home-made crunched up pork skin. 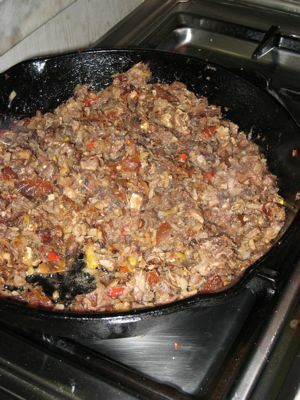 Original sisig, mind you, is roasted on a grill or open flame, smoky, but not as crunchy as a skin that was deep fried. Lechon sisig is the ultimate dish where these two meet together!! Im always a silent critic of sisig take-ons wherever I eat. But what earned my respect (and deep, inexplicable late-night cravings) are the Sisig Uno (brain-creamy) and Sisig Dos (crunchy) of the CIG Bar in Kamuning, which is owned by my friend Arvin. But lechon sisig would be oh so great too, there ought to be a Tres, if only lechon is easy to come by. Ohh, I was hoping you made a separate dinakdakan and included some of the lechon brain. I guess that is too much cholesterol for Marketman, family and staff. Katrina, I think there is still Pilo’s at West Avenue(? ), but the one along Katipunan has closed down years ago. MM,you’re lechon sisig is worth a try! there’s a small local rstaurant here in Navotas called Baby’s who served sisig very different from any other sisig I have known and tried. Its a creamy and spicy concoction of brain and crispy pata bits. It is not oily and hindi nakakaumay. fried neurons, do you mean mang jimmy’s? Try to reincarnate (?) lechon by cooking it with ginisang ampalaya for the ultimate tug of war between good and evil. A good recipe to try. At least now we have another use for the lechon head instead of the usual lechon paksiw! tnx as usual. Ariel, you can buy San Miguel Pale, Light and Negra at Trader Joe’s. It’s been there for at least over a year. Does it taste exactly the same as local San Mig? I think so. Although the bottle is different, it’s still good ole pinoy beer. I’m confused – the first and only time I’ve ever had sisig was at a local restaurant, famous for its sisig, on a visit to the homeland 8 years ago. I can’t remember the name of the restaurant now but it was one of those all-you-can-eat buffets and wasn’t at a mall. Their sisig was crunchy in a chicharony sort of way and loose as opposed to creamy and was served with spiced vinegar. I thought it was very very good but neither version here looks similar although the first version looks closer. Is this one of those dishes that varies from region to region? my goodness, MM…there MUST be a looot of MM lurkers where I live…went yesterday to my Suki and asked him to save the head for me again and I’ll pick it up today…GUESS WHAT! NADA!!!!!! It used to be nobody ever made PANSIN the lechon head he said till I came along. Then suddenly much to his surprise, people started asking for it!!!!!!!! HAIL the PIGS head lol, You hit the nail right on the head on this One Very Yummy Sisig indeed!! Man, now im craving Sisig if i could only reach through my monitor and have a plate of your freshly cooked sisig heehee, wishful thinking!! Brilliant idea MM! We usually have lechon for most occasions at home but now I have something to do with the head. Di ko naisip yan ah! I’m sure wala na ko mabibili lechon head sa S&R Fort. LOL! I used to eat this stuff. Now I can only look at it! Enjoy it while you can. By the way, moderation is a myth. Hey Lee, you took your funny pills this morning didn’t you?!? Nice going, buddy. Yeah! Trellis! Thanks for the memory jog! Hey Dale…since the lechon head was gone, I ended buying just the lechon pata and 1 pound of the liempo (lechon). …worked great as well..just rendered the liempo fat some more in a hot pan and drained the fat…and turned it to sisig ,too….masaaarrrrap! So remainder of the week…just bought gai lan and pea sprouts galore!!!! used to cook this on weekends everytime i went home to our province we would buy the pig’s head and bring it to the panaderia in the morning and pick it up like 5:00 and it will be this crunchy lechon ulo . save a lot on LPG too i think we only pay Php20.00 to the panaderia. anyway it is just on one side of the wood burning pugon. heat up the sizzling plate and pour on the soy sauce kalamansi and umm good with ice cold coke and lots of kanin. MM, did you mention “and icecoldbeer” for a perfect match. here in smoky mountain, tennessee my icecoldbeer goes with boiled peanuts, ugh! ala e naman . . .
ah favourite pulutan of mine! :) by the way, does anybody here know where to find sizzling plates for sale in manila or in cainta rizal area? thanks in advance! MM, how did you know i’ve been craving for lechon? Now you’ve come up with this brilliant idea of lechon sisig. Good thing I’ve got no problems with either my blood pressure or cholesterol so I can definitely have my lechon and sisig, too, for that matter. I hope I can still get lechon head at either Pingping’s or Casa Elar so that I can make this delicious-looking sisig (version 1) coz I’m not too keen on spicy food. Thanks, MM! lee, I happened to be sipping my ampalaya tea and nearly choked on your comment. You are one funny guy! I have never had sisig. this just made it to my “to do” list when I make it to Manila hopefully this july. As muuch as it looks appeticing, my heart says no. Sorry. Cholesterol is 160, borderline daw. Got to watch my diet na not like the old days when I can eat almost everything I crave. Now I mostly wish or tikim lang. Oh well. Hello Market Man. I always look forward to reading your food blog every chance I get. I came across it while looking for a recipe for chili crabs and I ‘ve been hooked ever since. I particularly liked the blogs about the best pork adobo you cooked, the fish pan issue (which I am now considering to buy) and most of all, your tribute to the sinigang na bangus sa bayabas, my all time favorite Filipino dish. And now sisig! hehehe! I really was shocked and pleased at how fatty your version has become. In general, I like my sisig to be crunchy with egg, as most us have been accustomed with. But I will never forget the original version of the sisig from Pampanga. It really tops my list. It is not crunchy but it is so creamy and so delectable, the experience of eating it is unforgettable. So please, please Market Man if you have friends that are from Pampanga who are willing to share their recipe for the original sisig, kindly post it in your blog. And do your version as well. MM: Great post on sisig… The second photo gave me an image of Hannibal Lecter scooping the cheeks out. Last time you had a post on little pigs under “Wallowing Pigs” and the post after that was the one on “Best Adobo ala Marketman” my initial thoughts (feeling shock and uneasy) were you must have someone slaughter one of those pigs for the adobo, great relief to find you actually bought the pork from S & R.
I think I will postpone my blood test for another month!!! Well there you go, 55 comments and running…Truly this dish is a national favorite! Yup, I always thought dinakdakan was the Ilocano counterpart of sisig. Brains do make it yumm-i-er! dhayL, i got my sizzling plate from Robinsons East, beside Sta. Lucia Mall. Most of the bigger malls has it, just check out their kitchen/utensils section. Brains and mad cow… eating bone marrow is not even recommended anymore. AleXena: the creamy one is from Aling Lucing in crossing while the crunchy one is from Mila’s sisig in San Angelo both from Angeles City, Pampanga. For those with cholesterol issues, the Makati Supermart Coffee Shop serves a mean tofu sisig. Even my kids love it! in the 80s, everyone gravitated towards pasig for the sisig. if i remember the names correctly, they are (were?) ‘nipa hut’ and the roadside ‘aysie’. de rigeur accompaniments then (and now) are calamansi, mother’s best hot sauce, knorr seasoning and diesel fumes. tsalap!!! It is understandable that mayonaise and pig’s brain are interchangeable ingredients for the creamier sisig as both consist mainly of fats (brain white matter is the fatty myelin sheath). Hi Joey…Yup, one lechon head for sisig = wayyyy too much for 2 people. So, I think you could still have your “sisig fix”!…After taking the meat out, just FREEZE whatever meat is left for another day. Now, the skin is another story. It may not be as crispy as when the lechon is still fresh, but you could put it under the oven broiler or turblo if you have it. I think that would work to crisp up the skin a bit. If it doesn’t, just add CHICHARON!!! why is it named sisig? SISIG: Swine ItsyBits Sizzling In Grease? Another Healthier Substitute would be grilled Fish Sisig. A restaurant in daly City serves this, tasted pretty decent to me. Now i dont know if you can even call it sisig due to its Authenticity but it was cooked and served like sisig. Okay folks are on laughing gas… Apicio, I fell off my chair. Lee, good one. I too, wondered how it got that name, but it seems it is now applied to several ingredients that have been chopped up and re-fried. HungryDude, I think now “sisig” refers to the style of preparation, though I agree the “original” was based on a pig’s head and other parts. bettyq and joey, yes, I think the pork pieces are very “freezable” and can be used at another time. quiapo, yup, both are “creamy,” and based on other comments like sister’s, I too might consider substituting mayonnaise for brain due to possible health concerns… but in the end, I didn’t like the creamy preparation as much as the first version. esquire, 53 pounds!? good grief, thank goodness I can’t get pregnant. :) thelma, yes, chopped liver is a frequent addition… but I am not a huge liver fan. CecileJ, thanks for that tip… a healthy sinful dish. Alexena, I have a previous sisig recipe, but I don’t think it is the “original” one you seek, it is in the archives, link in main post above. dhayL, the home section of shoemart sometimes has the sizzling plates. So does Landmark department store. pulutan, could you be a teacher perhpas in the smokey mountains? Myra P and others, the U.S. version of San Miguel is the same formulation, but a LOWER alcohol content. When I was at college there, folks used to look for a version that was brought over from Mexico that was exactly like the San Mig at home. U.S. beers are mostly lower alcohol content compared to say European or Pinoy beers. MM, climbing buddies have told me that San Miguel in Nepal has higher alcohol content, but it could be the altitude talking. Many a sherpa has warmed their nights with SMB, yak cheese and lentils. One of the best sisig i’ve tasted here in the SF bay area is from Andrea’s in Vallejo. They sell them only on weekends, i guess since they also get a lot of orders for whole lechon on weekends. Their sisig is on the crunchy side, but the consistency is a bit sticky so they may also be adding those brains. alilay, thanks for the info. sonny sj, oh cool, that’s close to my cousin’s house, so now she has no excuse not to buy one or two for me! thanks guys for the help! Riesling is good It cuts the greese, maybe you will forget your Cholesterol and Lipid levels Ha! Ha! Ha! I don’t think I have ever had sisig, but I bet I will like it. OMG that is gross! i am filipino and always new that Filipino food is fattening and sometimes wierd but Geez! i do love lechon tho. i don’t see the need for brains or a raw egg to make the plate of pig fat any creamier. that is all. Hi! marketman, this is my first time to post on your site but i’ve been a reader for a long time. I always liked wha i read and especially the discussions. I also make a mean sisig. when i was still in the phils. i am the barkadas official sisig maker. I was just wandering if you ever tried to use left over turkey.We have lots of it in the fridge and i was thinking if it will be worth my time to use it for sisig. thanks a lot and more power to your site. I do cook sisig similar to your first version, but yes, spicier, and I also add patis to the seasoning which gives it another level of complexity. Sooo yummy! Pig heaven! 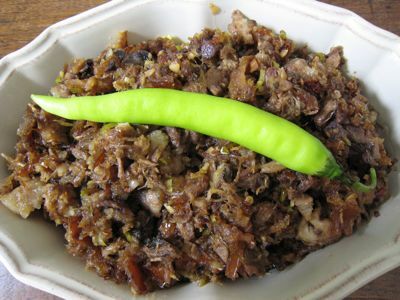 well ,just finished reading the recipe of sisig it makes me hungry oh my god i love that. in our place we call it dinakdakan. i agree it is more tastier if you mix the brain,and make it spicy and grill it way more better. adios amigos keep eating sisig or dinakdakan . we kababayan in vancouver well keep eating this oh….so…ooo good. 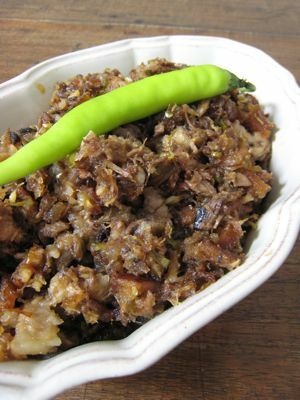 I am curious about this lechon sisig recipe, whichI have often read on this blog, but have not eaten or heard of it before. But after reading the above recipe, I now have a recipe for the face, snout, etc. I saw at the grocery here. Although, I don’t think it had the cheek. Must go back to the grocery and check if they have some more of that. I was actually salivating looking at it with some kind of dish in mind but I am all by myself and can’t or don’t want to eat it all by myself. I am thinking of roasting it first then do the sisig.